We are all currently a frenzy with tennis as Wimbledon 2015 reaches its final conclusion but did you know that it was actually the game of croquet that was first established and played on the lawns of this now hallowed ground? In fact the All England Lawn Tennis Club was previously known as The All England Croquet Club! So how the game of tennis (which is far less social, requiring more fitness and there’s a slight imbalance between the sexes) eclipsed the once outrageously popular croquet is a fascinating historical tale of money, literature and delinquency, including croquet being banned in the UK for players’ lewd behaviour…more later! But as history shows, all things worthy come back in fashion to which The Luxury Restaurant Guide is gladly championing as a supposedly genteel accompaniment to afternoon tea or summers’ lunch – read on below and scroll to the bottom for our fantastic member competition! Although most ‘serious’ croquet is played at clubs requiring some kind of membership the ‘social’ game can also be played in much the same way as the Victorians with a stately home as a backdrop. Country House Hotels all across the UK have retained their croquet lawns and many of them offer non-residents the facility to just turn up and play. All destinations are showcased in The Luxury Restaurant Guide and offer Luxury Restaurant Club members significant benefits when dining. Here we list the top 25 hotels in the UK with croquet facilities for you to enjoy. The origin of croquet, like that of many other sports, is obscure. As long ago as the fourteenth century, peasants in Brittany and Southern France amused themselves playing a game called Paille Maille, in which crude mallets were used to knock balls through hoops made of bent willow branches. It is also thought that something close to the modern game originated in Ireland and was known as ‘crookey’. By 1865 croquet had achieved wide acceptance across England and the colonies, growing in popularity partly because croquet was the very first outdoor sport to fully embrace equality, allowing both sexes to play the game on an equal footing. In 1869 the All England Croquet Club was founded with the purpose of creating an official body to control and unify the game, and four acres were leased in Wimbledon where lawns were created. 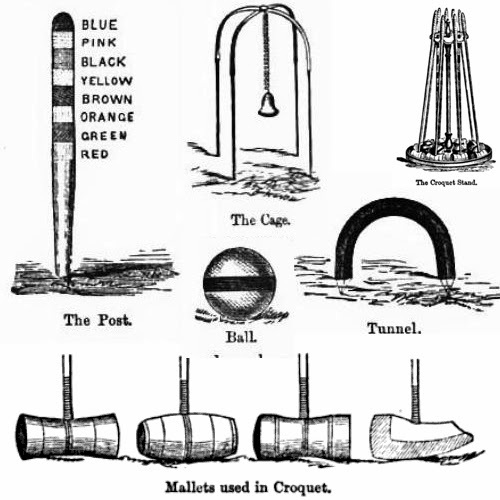 The rage for croquet further grew when Jaques of London, the oldest games manufacturers in the world, wrote down the rules of croquet and began selling complete croquet sets – they are still the main manufacturer of sets to this day and are also said to have ‘invented’ croquet. In fact the close literary association of Alice In Wonderland with croquet could be directly through the Jaques family. John Jaques II was running the business in the 1860s and was a friend of Charles Lutwidge Dodgson, better known by his pen name Lewis Carroll. Enthusiasm for the sport began to wane at the end of the century however due to a surge in popularity of a new game, Lawn Tennis, and a growing perception that croquet was played by gamblers, drinkers and philanderers landing it a vaguely unsavoury reputation. As said, it was actually banned for a time due to reports of ‘lewd and lascivious’ behaviour. As tennis proved itself to be more of a money maker and the craze for croquet tailed off more of the ‘lawns’ were given over to the new sport and the first official Wimbledon Tennis tournament took place in July 1877. The club used the competition to signal its name change to the All England Lawn Tennis and Croquet Club, holding the championships on the grounds which only two years previously had been exclusively used for croquet. This period of decline lasted until the beginning of the 20th century when the United States began a revival and the sport became a favourite of literary and entertainment people in the ’30’s and ’40’s. Various changes to the rules occurred and in 1922, the Willis setting of six hoops and one peg was introduced in England. This layout is still the one most used today. 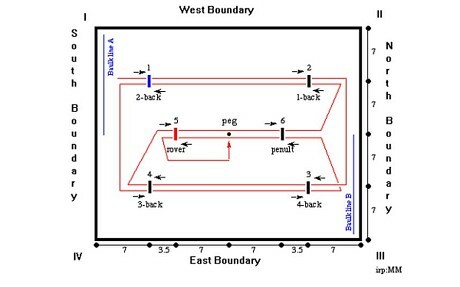 The original game, known today as Association Croquet, is a race around the circuit of hoops in the order and directions shown in the diagram above. The Blue and Black balls play against the Red and Yellow balls. It is possible to put together a break (as in snooker) and the first side to get both of their balls through the hoops in order and hit the peg is the winner. Once a ball has completed the circuit and hit the peg (is pegged out) it is removed from the game. There is also a simplified form of the game, also with a long history, called Golf Croquet, which is more interactive (each turn is a single stroke) though it requires a similar level of accuracy and tactical awareness. 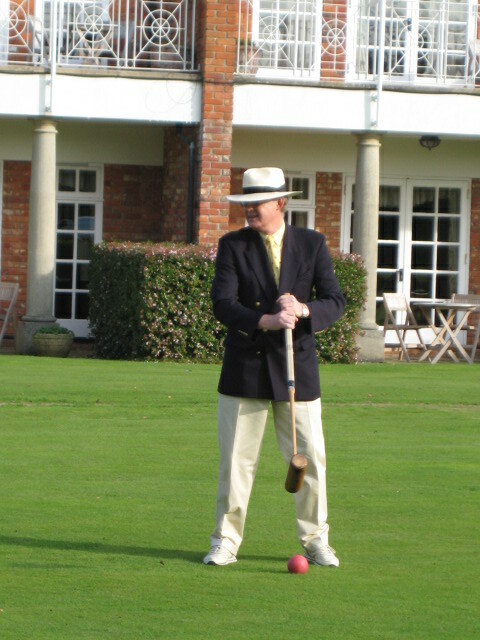 As part of our revival quest the team from The Luxury Restaurant Guide were kindly invited last week for a croquet lesson with Croquet ‘Pro’ Martin Dock from ‘Croquet For Events’ by the iconic and historic Cliveden House Hotel. The croquet lawn is permanently set up throughout the summer right next to the legendary swimming pool synonymous with the Profumo Affair. The team were met with glasses of fruity Pimms which soon brought out the more competitive spirit. Peals of laughter and shrieks of outrage were soon ringing out as the games got underway and the team have all decided they are addicted! The afternoon was beautifully rounded off by Cliveden’s famous afternoon tea served overlooking the lawn. Our huge thanks to Cliveden for the wonderful treat and to Martin for the excellent lesson. 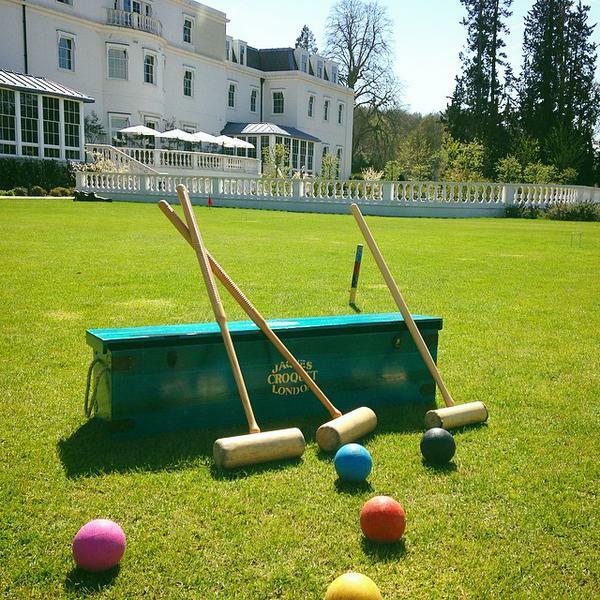 Martin Dock offers croquet events at Chewton Glen, Cliveden, Coworth Park and beyond. Martin has all his own equipment and depending on the space available he can get up to 16/18 people playing at the same time making the game suitable for corporate events and social occasions alike. Martin is also very happy to work with lower numbers and is currently running a special at Cliveden House and Chewton Glen for individuals up to 4 people for an hour and a half at a cost of £150. Prices for other locations available on request. More information at www.croquetforevents.com or call 01344 441958/07803 043511. 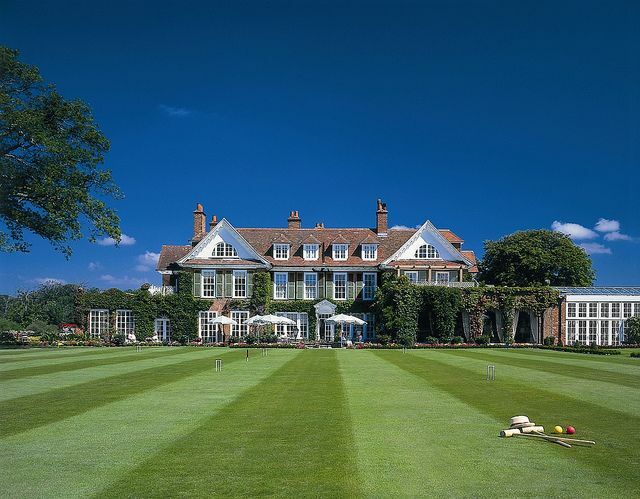 Fabulous Member Competition – Win a Croquet lesson for four and Afternoon Tea at Chewton Glen! Simply answer the following question: When was the All England Croquet Club founded? Email your answer to claire@luxuryrestaurantguide.com along with your name and membership number, using the email subject of ‘Croquet Competition’. Competition closes Friday 10th at noon. Full terms and conditions here. Not a member? To take advantage of fantastic member benefits sign up today at www.luxuryrestaurantguide.com for just £95 for a whole year of fabulous rewards. 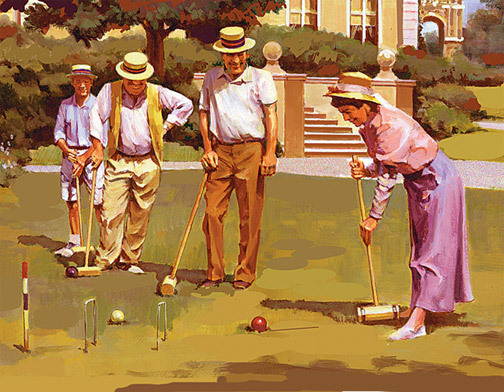 My wife and I were the very fortunate members who won the Croquet Competition. Together with my daughter and a friend we met with Martin Dock (www.croquetforevents.com) at Cliveden and he introduced the game of Croquet to us. We spent a very enjoyable couple of hours whacking balls around the course and found it surprisingly competitive and anything but genteel! We’ll definitely be playing again. And then on to tea… a sumptuous spread of delicious eats, flavoursome teas and a glass of bubbling Champagne, taken in the glorious surroundings of Cliveden. It was a memorable afternoon and our heartfelt thanks go to The Luxury Restaurant Guide for giving us the opportunity – very much appreciated. We are delighted that you enjoyed such a super day and thanks so much for your lovely comments which we have passed onto to Cliveden and Martin Dock. We agree that croquet is addictive!